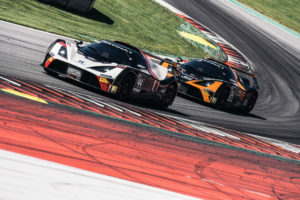 The second race weekend with Reiter Young Stars took place at Redbull Ring – Spielberg and the forecast look rather uncertain as it showed either to be shiny skies and 26 degrees hot or rain and much cooler temperatures. The weekend started out with troubles already in FP1 as the engine failed and with FP2 only three hours away the team was uncertain if the drivers would get any chance to get back on track. But with the outstanding REITER Engineering crew of mechanics the engine was changed in only three hours and within time for FP2. As the night settled over Redbull Ring – Spielberg the clouds gathered and during the night it rained heavily. At 8.30 the rain had fortunately stopped but the track was still soaked and Naomi Schiff Racing headed out with wet tyres. For Q1 Naomi managed to do well on the wet track and secured a P21 for Race 1. Since the engine had to be changed, unfortunately the team got a grid penalty and would have to start from the back of the grid in P30 for Race 1. As Marylin Niederhauser took over, the track had started to dry up something Marylin quickly took advantage of as she qualified P14 for Race 2. During the afternoon the clouds were no longer anywhere to be found and as Race 1 was about to start the track was once again hot and dry. With a chaotic start Naomi, who started the race, quickly managed to climb and despite a lot of yellow flags she managed to pit in P19. With Marylin behind the wheel for the second stint the progress went on and as the chequered flag waved she had secured a P13 and a P7 in the Silver Cup. An amazing drive from both drivers and the team was very happy. On Sunday morning the sun shined bright once more and for Race 2 Marylin rolled onto the grid in P14. Unfortunately, during lap 2 a race incident broke the left steering and Marylin had to retire the car. Unfortunate as the team felt confident after Race 1 but such is racing, when always pushing towards the limit, sometime incidents will occur and we see it as a learning experience. Even though the weekend was troubled, good progress has been made and the experience gathered will be utilize at the next race at SLOVAKIA RING – official site the 15-16th of July.